"In fact there was no such direction from the Supreme Court, but you took it and used it as a tool to make Aadhaar mandatory for mobile users." New Delhi: The Supreme Court on Wednesday raised questions over the government’s decision ordering mandatory seeding of mobile numbers with Aadhaar and said its earlier order on mandatory authentication of users was used as a “tool”. A five-judge constitution bench headed by Chief Justice Dipak Misra, hearing a clutch of petitions challenging Aadhaar and its enabling 2016 law, said its order on a PIL filed by Lokniti Foundation had said that mobile users needed to be verified in the interest of national security. “In fact there was no such direction from the Supreme Court, but you took it and used it as a tool to make Aadhaar mandatory for mobile users,” the bench, also comprising Justices A.K. Sikri, A.M. Khanwilkar, D.Y. Chandrachud and Ashok Bhushan, said. Senior advocate Rakesh Dwivedi, appearing for the Unique Identification Authority of India (UIDAI), said the Department of Telecommunication (DoT) notification talked about re-verification of mobile numbers by using e-KYC process and the Telegraph Act gave “exclusive power to central government to decide license conditions” of service providers. “How can you (DoT) impose condition on service recipients for seeding Aadhaar with mobile phones,” the bench said, adding that license agreements were between the government and the service providers. “In the Lokniti Foundation case, the SC has not directed linking of SIM with UID. But the Union government’s circular says so. There was no direction by the court…” Economic Times quoted Justice Chandrachud as saying during the hearing. 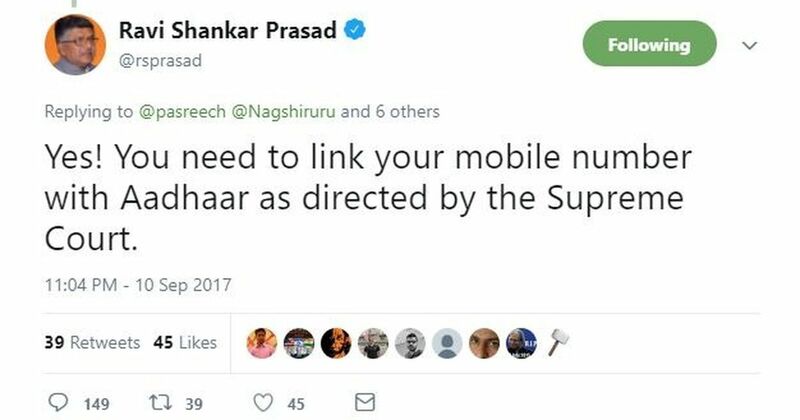 In September 2017, law minister Ravi Shankar Prasad too had said that the Supreme Court had made it compulsory to link Aadhaar with mobile numbers. Writing in The Wire then, Gopal Krishna had pointed out how the media was misrepresenting the Supreme Court’s words. Dwivedi said the direction to seed mobile with Aadhaar was taken in pursuance of TRAIs recommendation. Besides, the government was entitled and had legitimate state interest to ensure that a sim card is given to only those who applied, he said, seeking to allay apprehensions that the state will surveil the people 24×7. “My submission is that the government had a legal basis to link Aadhaar with SIM by virtue of section 4 of the Telegraph Act and also, the measure is reasonable in the interest of national security,” the lawyer stressed. Dwivedi, at the outset, alleged that the Aadhaar scheme was being unfairly targeted as nobody was questioning the banks and the telecom firms on collection of information. “Appreciate the fact as to how much information a bank possesses about its customers. Every transaction as to what I purchase by using cards, where and when, all this information is with banks. Aadhaar does not tell all this. This information are already there and is being used for commercial purposes,” he said, adding that a person starts getting numerous calls before their car insurances expire. He said people are being “scared” about Aadhaar but “nobody questions the telecom companies, banks…. Their single target is Aadhaar”. Dwivedi informed the bench about an app, available on Google Playstore and said it has so many personal information about a person. He gave details, procured by using the app, about him, his family members to the bench. The bench was pleasantly surprised. Dwivedi said it has details regarding how much he charged the Jammu and Kashmir government for appearing in a case. The lawyer referred to the control being enjoyed by the UIDAI over entities, private and government, which seek Aadhaar authentication for providing services and benefits to citizens. These entities cannot track any individual by using these information and moreover, they themselves have enough information with them, he said, adding that Aadhaar cannot lead to surveillance as apprehended by the petitioners. “Vodafone can do targeted advertising using the data which is already happening without Aadhaar. Vodafone has far more demographic data about an individual than UIDAI has,” Dwivedi said, adding that at the most, such details can lead to formation of a directory and targeted advertisements is happening already. “Google and Facebook process tremendous data on a daily basis. UIDAI does not have that kind of algorithm,” he said and urged the court to save the Aadhaar law and suggest measures, if any, to make it work. He referred to a list of entities and said most of them required one-time authentication and hence there was no question that State will surveil the people 24×7. He also referred to inbuilt security features in the law and system of Aadhaar authentication. Dwivedi concluded his arguments on behalf of UIDAI saying that CIDR was safe, data was encrypted and was held offline and above all, the Aadhaar scheme was safer than smart cards as there was no chance of data breach. 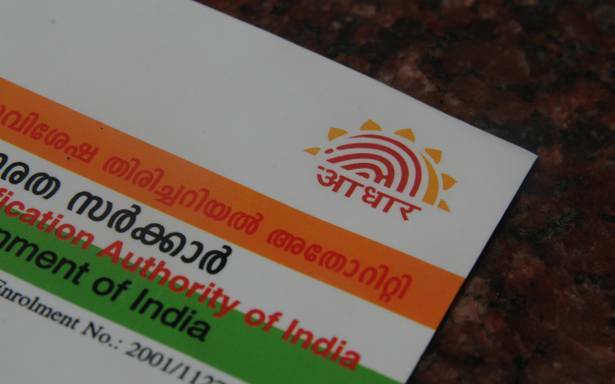 Lawyer Gopal Shankarnarayan, who started his submissions, said the right to identity was an “absolute fundamental right” and Aadhaar provided a kind of proof of identification to all Indians.